Welcome to the 2013 football season and our first edition of The Pick List. Each Thursday throughout the regular season, we will feature six of the best match-ups across the state, and make our predictions on a handful of other games. One of the premier early-season matchups, Carroll and Heights have been contenders in Class 5A and 6A, respectively, for years. This contest has been Week 1 for many seasons; in the last seven years, Heights holds a 4-3 edge. Carroll won 47-16 last season en route to a 13-0 record and a dominant Class 5A state title. From 2006-08, each meeting was within seven points. The last four meetings have been decided by 28, 21, 31 and 31 points. Carroll is 49-3 at home since the start of the '04 season, according to MaxPreps. The Eagles have not lost a regular season game since the 45-14 loss to Heights in the 2011 season opener. Heights assistant Terry Harrison takes over for Rick Wheeler, who is now the Falcons' full-time athletic director. Heights finished 7-3 in 2012 and returns nine offensive and seven defensive starters. Senior defensive lineman Aderio Ammons earned all-state honors last season. Tre King returns after he broke his ankle Week 5 of last year, and Curtis Whitten collected 728 yards a year ago. Carroll broke through for its first football title since 1978 and first under 19th year coach Alan Schuckman. Carroll has now reached the playoffs 11 straight years and has 17 winning seasons. Tory Smith rushed for 1,079 yards and Denzel Goolsby, one of the state's top junior prospects, tacked on 331 yards and 10 scores. Seniors Patrick Dugan and Nate Stallbaumer combined for 109 tackles and 51 tackles for loss. Carroll gets a slight edge for playing at home and still returns plenty of talent. An early showdown between ranked teams highlights the Eastern Kansas League schedule as Gardner-Edgerton travels to Blue Valley. These two teams have become quite familiar over the past few seasons. The Trailblazers and Tigers met both in district play and in the state semifinals back in 2010 and in 2011, and they opened the 2012 season in a driving rain storm. In that game, Gardner-Edgerton’s Anthony Smartt returned the opening kickoff 95-yards for a touchdown which held up in a sloppy 8-6 Blazer win. The weather led to a combined 10 fumbles, two interceptions, and seven turnovers on down. This season each team enters with high expectations. Gardner-Edgerton finished 6-4 in 2012 and reached the 6A playoffs before falling to Lawrence 34-32 in the first round. The Blazers are headlined by senior running back Traevohn Wrench, who rushed for 2,268 yards and 25 scores last season, after his stellar 2,434-yard, 34-touchdown sophomore year in 2011. Wrench, who has verbally committed to Kansas, is a two-time Kpreps all-state selection at running back. He was limited to just 29 yards on 23 carries in last year’s game; including an early 23-yard run. Hobby returns for a third season under center to try and take some of the pressure off of his backfield mate. He threw for 1,326 scores and 13 touchdowns last season. Blue Valley returns 11 starters from a 2012 team that finished 6-5 and reached the Class 5A state quarterfinals before falling to St. Thomas Aquinas 23-22. Six of the Tigers’ eleven games last season were decided by a touchdown or less. Eric Driskell’s group returns quarterback Logan Brettell and a solid core of receivers in Tristan Perkins (6-3, 180), Mikey Henson (6-3, 185), and tight-end Zach DeLeon (6-5, 225). Senior Chance Nelson will move into the backfield to try and fill the void left by Ryan McNerlin who has moved on to Pittsburg State. The Tiger’s strength may be up front where senior Blake Freeman (6-4, 265) and junior A. J. Harris (6-5, 295) will try and help replace a Kpreps all-state selection in Clay Rhodes who went to Missouri. Harris is garnering some several Division I programs and has landed offers from Kansas State and Missouri. The Tiger defense will be led by linebacker Henry McGrew (6-3, 240) who has verbally committed to Illinois. A solid match-up between traditional powerhouses will take place in Class 4A as second-ranked Andale travels to take on Wichita Collegiate. The Indians and Spartans opened the 2012 season as well with Collegiate pulling out a 41-27 victory. Andale led that contest 21-20 at halftime, but could only muster a Logan Horsch interception return for a touchdown in the second half. Collegiate turned an Indian turnover and a turnover on downs in to 14 points to claim the victory. If the Spartans are to have similar success this season, they may need another strong year out of senior quarterback Landon Root (6-3, 200). Root, who has verbally committed to Northern Illinois, passed for 1,600 yards and 18 touchdowns last season while rushing for 615 yards and 11 scores. The former Kapaun Mount Carmel product will have a new weapon to throw to this season in senior wideout Bret Waddell who transferred from Rose Hill over the summer. Waddell was the primary receiving threat for the Rockets during the 2012 season, catching 54 passes for 967 yards and 11 touchdowns. He will be a welcome addition for the Spartans which will have to replace running back Isaiah Franklin and wideout Markus Phox who both had big-play capability. Meanwhile, Andale’s expectations are high as the Indians return 11 starters from a 9-2 team that fell 42-36 to McPherson in the 4A quarterfinals last fall. Among those returners is quarterback Jared Smarsh who will enter his third season under center. Hunter Knoblauch returns at running back and should benefit from a talented offensive line that includes Trevor Buckner (6-3, 250), Ben Walther (6-6, 265), Mike Maus (5-8, 200), and Nathan Bergkamp (6-3, 200). With back-to-back state runner-up finishes the Eudora Cardinals are poised to become one of class 4A's elite programs, but the man who built the Cardinals into a championship contender is gone. After posting a 96-30 record in 12 seasons as the Cardinal head coach, Gregg Webb has moved on to the rebuilding project that is Truman High School in Independence, Missouri. Webb is one of the Sunflower State's all-time great coaches, enjoying tremendous success at Claflin where he won five state titles and reached the championship game a total of nine times. Veteran coach Kevin Kopecky (Leavenworth & St. Thomas Aquinas) will take over a Cardinal program that welcomes back eight players with starting experience. Included among those starters is standout quarterback Andrew Ballock and a big, experienced offensive line that welcomes back all five starters. Kopecky's Cardinals will be tested early when they travel to play the KC Piper Pirates. Piper finished 10-3 in 2012 with two of those losses coming to Eudora, a 21-7 defeat in the state semi-finals and a 25-7 loss in the season opener. Piper has shown consistent improvement over the last four seasons going 6-4, 6-5, 7-4, and finally 10-3, and two key pieces of the puzzle are back that could give the Pirates a chance to take the next step this season. Tanner Eikenbary is back to lead the offense after throwing for 2,700 yards in two seasons as a starter while top class of 2015 prospect, linebacker Colton Beebe will spearhead the defense after posting 104 tackles a year ago. While Piper appears to be on the rise, Eudora returns too much experience for the Pirates to celebrate a week one victory. Olpe travels to Sedgwick in an intriguing match-up between two strong playoff contenders in their respective classifications. The Eagles and Cardinals opened the 2012 season against each other as well, with Sedgwick winning 35-7 over a young Olpe team. But Chris Schmidt’s Eagles are a year older and stronger, and they return 14 total starters from an 8-3 season. The Eagles should be solid up front where they return Kpreps all-state selection Joe Redeker (6-2, 185) and Chance Stout (6-4, 220). Bo Krueger returns at quarterback with Isaac Hall in the backfield. Hall rushed for nearly 500 yards and nine touchdowns last season. On defense, the Eagles feature Redeker at linebacker who registered more than 150 tackles. He’ll be aided by Stout on the defensive line and Kruger at defensive end. Sedgwick put together a solid playoff run to the 3A quarterfinals last season before falling to Beloit, 52-24. Jeff Werner’s Cardinals return eleven starters on offense including senior running back Dalton Brandt. Brandt (5-9, 180) rushed for 1,724 yards and 21 touchdowns as a junior a season ago. Junior Brylie Ware returns at quarterback after missing the second-half of last season with a knee injury. Ware threw for more than 1,100 yards and nine scores before he went out in Week 5. Logan Thompson, an eventual Shrine Bowl selection, stepped in and had a great year running and throwing for the Cardinals, but he is now on the sidelines at Kansas State. Expect this to be a tighter game than a year ago, but the Cardinals’ depth might eventually prevail. 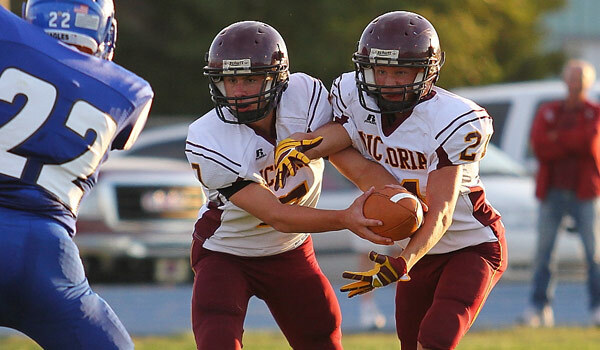 The Central Prairie League foes are longtime contenders and have combined for three state titles and a runner-up showing in the last decade. Victoria is 3-2 against the Mustangs in the last five years with every game within 24 points and two contests by two points apiece. This has been the season opener for both teams every year since 2008. Victoria has 11 straight playoff appearances, currently the longest eight-man streak, but is 1-3 in the postseason in the last three years. This is arguably the most talented Knights' team, especially offensively, in the last five years. Macksville missed the playoffs for the first time since 2004 last year. Defensively, the Mustangs allowed 35.8 points per contest after it allowed 26.1 in a 10-1 season in 2011. Tanner Tranbarger is also one of Kansas' top players after he rushed for 1,325 yards and passed for 1,021 yards. Defensively, he collected 111 tackles and picked off three passes. Macksville returns five offensive and six defensive starters, including three seniors. Victoria gets the season opener at home - since the start of the 2005 season, the Knights have won 81 percent of home games and 73 percent of road games. Plus, the Knights have slightly more experience and weapons, especially with Dreiling, arguably the best eight-man receiver in the west.